Apart from its classical functions at the cell membrane, p120 can also regulate RhoGTPases when translocated to the cytosol (see p120 in lobular breast cancer page). Furthermore, it can interact with and relieve transcriptional repression of Kaiso, leading to expression of distinct target genes. Although controversy still covers the validity of the small number of targets that have been identified, alleged Kaiso target genes show overlap with Wnt signaling targets. As such it advocates Kaiso in a plethora of multiple developmental en pathological processes, including the regulation of tumor development and metastatic disease. We have and are studying how Kaiso regulated gene transcription in cancer in a genome-wide manner. We initially focussed on the regulation of Kaiso by p120, but are also interested in p120-independent transcriptional regulation by Kaiso. We have published on how p120 reliefs Kaiso-dependent transcriptional repression of Wnt11 through its classical Kaiso Binding Sequence (KBS) TCCTGCNA, and the effect this has on tumor malignancy (see below). Immunofluorescence (IF) showing human and mouse ILC cells (E-cadherin mutant). In contrast, E-cadherin positive breast cancer cells (E-cadherin wild-type) do not express nuclear p120. Arrow heads depict nuclear p120 expression, size bars are 10µm. 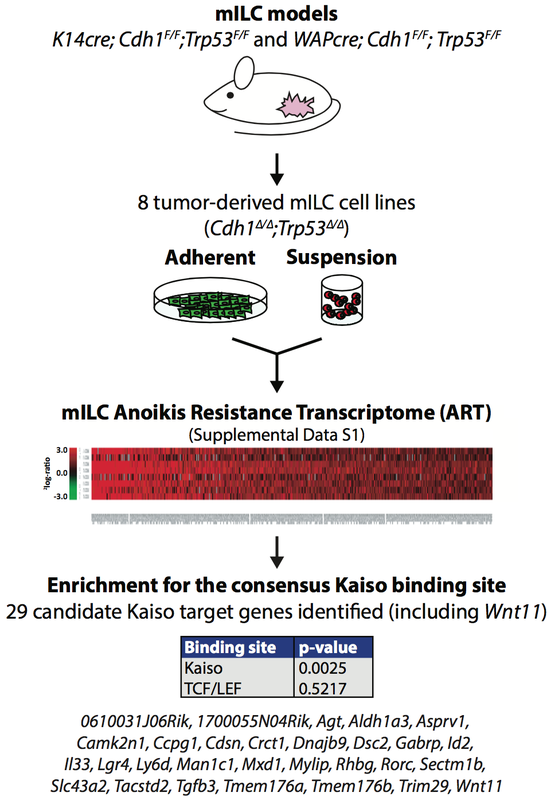 The mILC Anoikis Resistance Transcriptome. To identify candidate Kaiso target genes upregulated in anchorage-independent conditions, eight independent mILC cell lines were cultured in adherent and suspension and subjected to genome-wide micro-array analysis. We identified 249 genes that were upregulated in mILC cells cultured under anchorage-independent conditions and termed this gene list the mILC Anoikis Resistance Transcriptome (ART). Subsequent transcription factor binding site (TFBS) promoter analysis of genes within the mILC ART revealed enrichment for the consensus binding sequence of Kaiso (Kaiso binding site: KBS). No enrichment for TCF/LEF binding sites was observed. Based on the presence of KBS sequences in the promoter regions of genes within the mILC ART we identified 29 candidate Kaiso target genes including Wnt11. The p-values reported in this figure are the result of initial testing for the KBS and TCF/LEF consensus sites.